It’s well-known that farmer’s best source of information is other farmers. By interacting with other farmers, you can see, you can touch what it is that’s happening. It’s very practical and very accessible. As a result, demonstration is a very important part of farmer learning. But we don’t actually know that much about demostration. The European project PLAID will create for the first time, an inventory of demonstration on farms across Europe. It will cover all sectors in production systems, from animal husbandry to vegetable growing in conventional and organic farming. INVENTORY OF DEMONSTRATION FARMS. Demonstration activities can be organized by farmers, by private companies, by advisory services, by research entities, by charities. There’s a whole range of organizations that do this, and they range from individual, kind of, afternoon events at a farm, to meetings that go on regularly over the course of a year or two years with the same group of farmers. One of the main outputs of the PLAID project is an inventory of demonstration farms across Europe. The project will have a clickable map, where you can click on a geographic location, or you can search by search terms to find out where else in Europe particular kind of demonstration are happening. BEST PRACTICE GUIDELINES. There isn’t actually an established best practice on how you go about doing demonstration, even though running demonstration activities are really common. The project’s going to be doing some research on the topic, to bring together some really practical, useful guidelines on how you can be doing demonstration better for the people that you’re trying to interact with. IMPROVING ACCESS. There’s an issues where demonstration activities are primary attended by same sort of group of farmers, and so what the project wants to look at is how you can increase the range of people that come to demonstration activities. ADVANCE SCIENCE IN PEER-TO-PEER LEARNING. 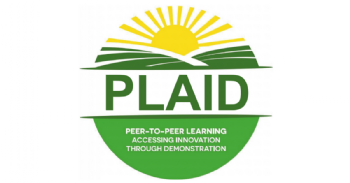 In addition to these very practical outputs, PLAID will advance a state-of-the-art in peer-to-peer learning, and so what the project will do is to put together a conceptual framework that combines innovation theory with recent social learning, social psychology, and social capital theories. The PLAID project started in January 2017, and will carry on summer 2019. There is a consortium members from across Europe.